When I find cool segments of blu-ray movies or awesome movie trailers I like to show off in my theater room, I have a special place on a computer on my network that I store ripped chapters of the blu-rays or movie trailers. I love to play them using my Sony BPS-S3100 down in my theater room from said computer on my network. What stumped me is that, at first, I would add files to the computer, but they wouldn't show up when I would browse the available folders on my blu-ray player. Old files would show up fine, but the new ones would not. Thinking it was a caching issue on the side of the blu-ray player, I spent an hour muddling through menus looking for ways to get it to refresh. I finally found a place in the settings that would allow me to remove my computer from the content server list and re-detect it. Unfortunately, that didn't solve the issue. It turns out the issue resides on the computer serving the content. I assume this information will be relevant to any DLNA server and the clients trying to consume the content. If not, please leave a comment correcting me where I am mistaken. The DLNA server in question must be told to refresh the media library information to apply any changes you have made to your library (whether that is new/modified/deleted files or meta-information stored within the files like ID3 tags, etc.). The procedure for updating will be different for different types of Media Servers, but if you have found your way to this article and discover the proper way for your DLNA media server to update/refresh your media library information so it can appear on your client, please leave a comment with the steps to do so and I will update this article with the steps for each server. 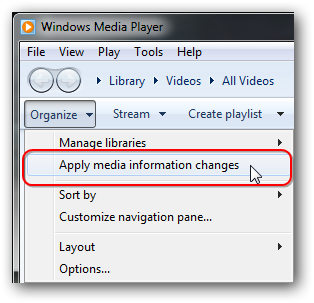 Click "Organize" >> "Apply media information changes"